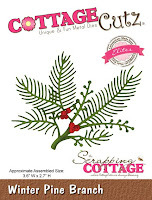 Yipee, today is reveal day for a special release called "Homemade Christmas Gift Set" from CottageCutz. 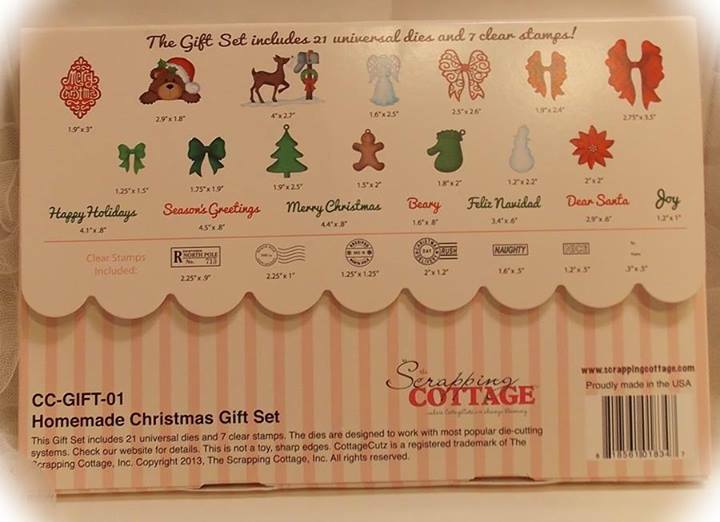 There are 21 universal dies and 7 clear stamps in this box giftset. Isn't this bear just darling. You know I love my bears. I can't resist his sweet face. 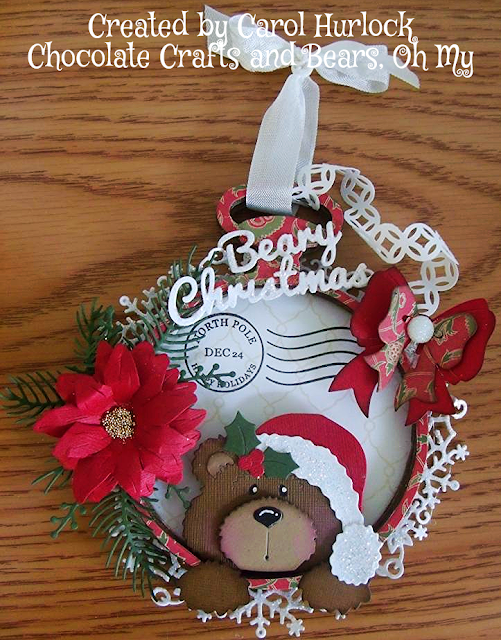 To create this Christmas Ornament, I started with Tim Holtz Pocket Watch Die. I cut it out about 5 times to get the dimension. I cut the center out of four of the dies and layered one on top of the other. I cut designer paper for the inside and outside of the watch. 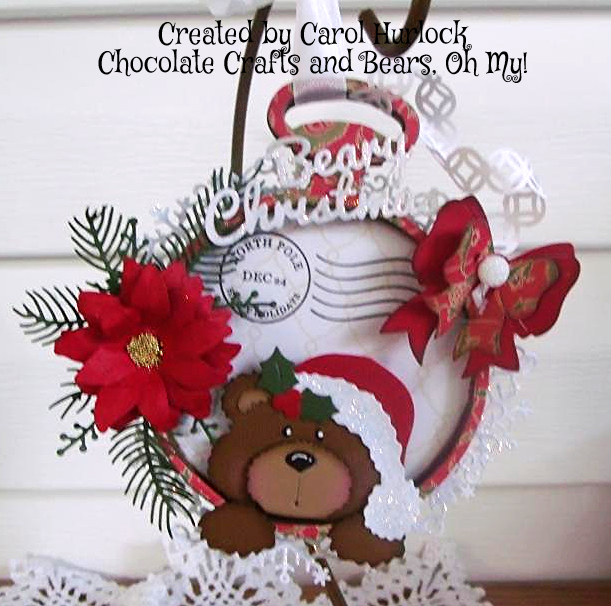 I stamped the little postal image from the Cottage Cutz Christmas Gift Set in the center. I just love that little stamp. I know I will be using it a lot for all my Christmas crafting. 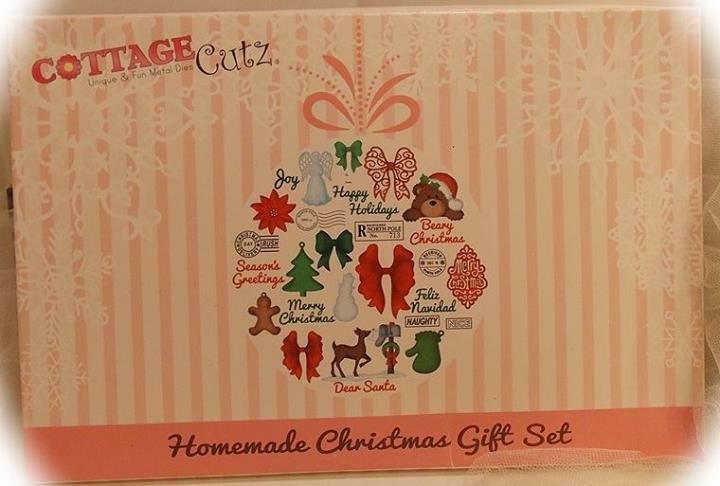 Almost all the embellishments were made from the dies in this gift set. There is just so much you can do with them. The flower was cut out three times. I used my McGill Flower shaping tool to created the Poinsettia. The leaves are the Winter Pine Branch. The snowflake edging is the Winter Snowflake Wreath. I die cut the wreath twice and cut it to fit around the pocket watch. 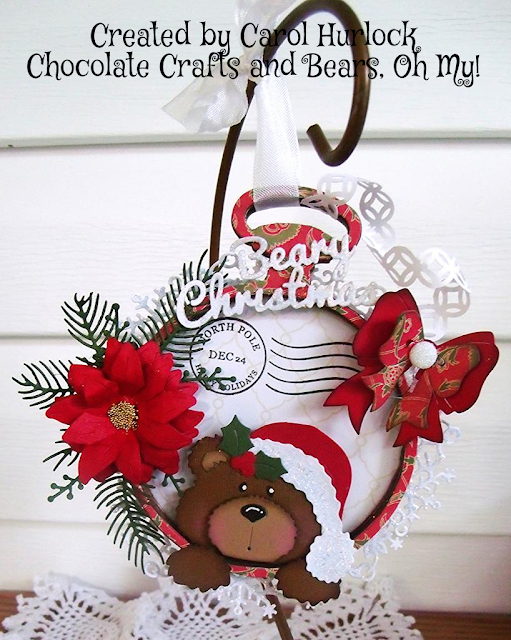 The chain is created using a Martha Steward Border punch. I just cut it so it would be rounded to look like chain and twisted it and attached the bow at the end. You are so clever and amazing!!! I love all the die cuts, glitter, and the over all project!!!! I love your beautiful Christmas ornament, Carol! 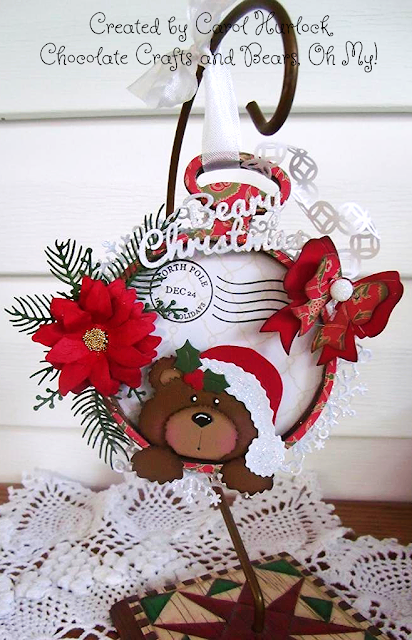 What an awesome mix of dies and stamps from the new release Homemade Christmas Gift Set. They work so well together! You always inspire me with your gorgeous creations! Oh, this is 'you' for sure, Carol, with that precious bear. How adorable!!! Hello Carol. My Goodness, it's being forever sins last time i visit you or anybody else. I stroll down to see all your projects. It was Oh and Ah and WOW!!! So so beautiful. thank you for the inspiration. 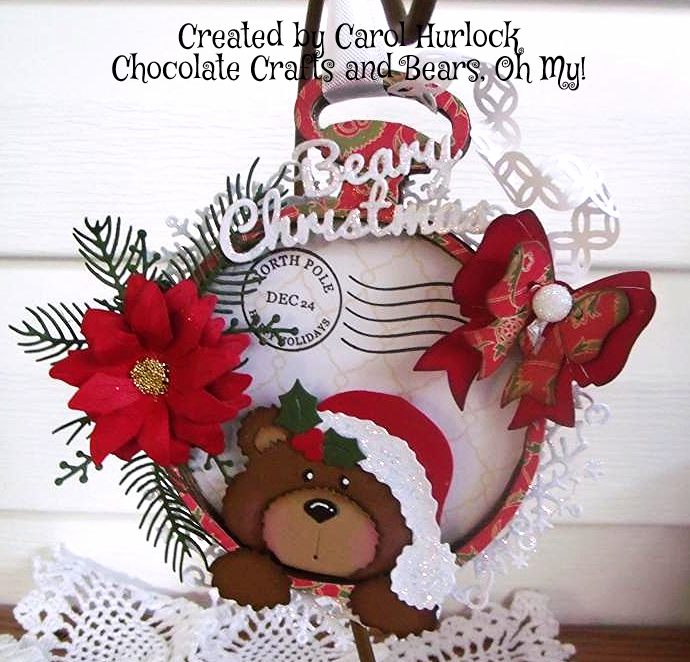 this is gorgeous Carol, so beautiful made. 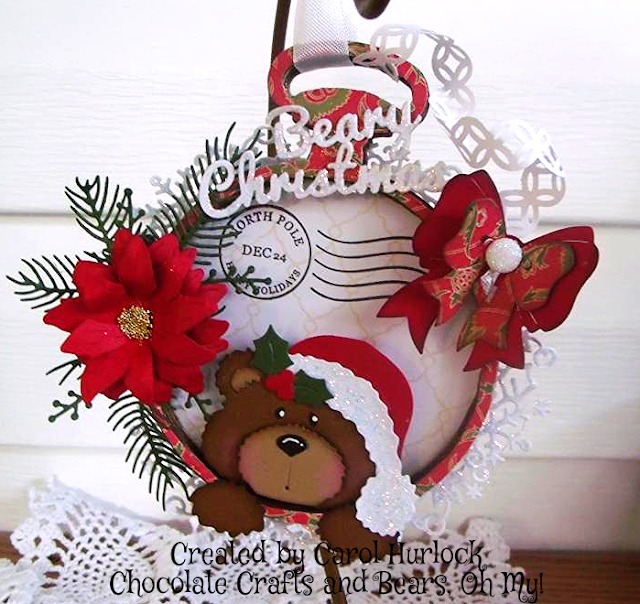 There he is in all his glory :) Such a cute bear and love the added bow and poinsettia around him. Fabulous use of the dies!! This is just the sweetest little Xmas bear! This would be a Xmas gift in itself it is so adorable! Absolutely Darling!! 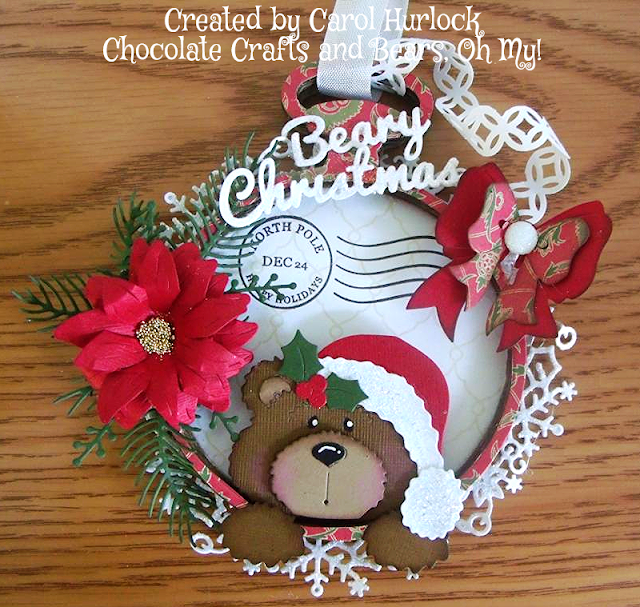 Love all the details on this carol!! And that Christmas teddy bear is just too sweet!!! beautiful job! This is precious! Love the bear - he looks so adorable in this fun ornament and all the great dies make this unbelievably wonderful! Wow! Everything is perfect! So you! So fun! Hugz!!!! !